Given this air conditioner's compound ranking of 82%, we are confident that the SPT WA-1211S 12000 BTU is currently Alphachooser's best SPT air conditioner 2019. Furthermore, we think that our 588 reviews sampled from our sources give us a high confidence level (more on confidence levels) that pushes us to label it a "no-brainer best choice." 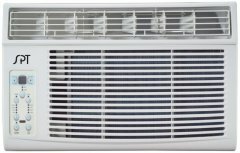 With its star rating of 4 averaged from 276 reviews, here is what we consider second best SPT air conditioner. * This list is based on an in-depth analysis of hundreds of reviews from around the web. A window-mounted air conditioner that can cool down an area of 400-700 square feet (at least according to SPT) running on 12000 BTU. An evaporative air cooler suited for hot and dry places, using an endothermic reaction process to convert heat into a stream of cool air.